Nice work! do you now if it is possible to pass the button click to a TS variable so we can make the user postpone the update ? Hi Bend, yes it’s possible but you would need to write the button click output to file and then run another script to read it, because the notifications run in the user context where you can’t read or write TS variables. Thanks for quick response.. could be awesome if it was possible to display a counter, with a delay so the user eventually was forced to do the upgrade, like with Powershell app deploy toolkit.. do you know if that is possible in user context ? Or I could just use Powershell app deploy to create the file, and then kick off your script..
That is possible but would require some custom WPF added to the notification. You would also need a mechanism to wait for a response as the TS will not wait by default. But I’m intrigued why you would want to postpone a running TS. Why not just make it available with a deadline? Because users forget, and if the deadline is passed, it will be forced and interrupt their work.. I work at a law firm, those are not easy users 🙂 they would just keep postponing it with the first solution I guess..
Looks like the Powershell scripts in the Zip file is missing? Nope they are all there in the “OS Upgrade Notifications” folder. Check your AV didn’t block something. Hello, great work. I’ve tested this out and all works well except for the final notification that the upgrade is complete when the user logs on. For some reason the runonce doesnt trigger for the user when logging in after the upgrade. Any ideas? Assuming that the Show-UpgradeSuccessfulNotification.ps1 was copied to C:\temp and the RunOnce key was correctly set, does it trigger after the system reboots? Hi Trevor, the file is in c:\temp and runone key set, but just doesnt run at the next logon. Running the command manually works fine. Interesting. I only saw that once where the system needed a reboot first. Every other test worked perfectly. Maybe AV is blocking it? Hi, looking into the RunOnce keys only work if the user logging on is an administrator (this works). However this wont be the case normally so need to find alternative method. Ah yes. Thanks for pointing out. I’ll try to find a more generic alternative way to do that. To work around this, I’ve used an ActiveSetup to run the PowerShell script and as the last step in the script, deleted the script from c:\temp so that this only runs for the first user who logs onto the machine. This appears to work well. Nice, thanks for the tip. I’ll check that. Trevor did you you make the changes you implemented in your example, if not can you provide some detail on how you made it work. Hi, I have a couple questions about this. Is the custom background supposed to survive a reboot or do we need to run it after every reboot during the upgrade process? Another question: is there a way we can bring up a command prompt without making the custom background go away? Kind of like the ability to press F8 in WinPE. Also, it would be nice if it showed during the lock screen too so the user doesn’t try to login. Thanks for all the work you’ve been doing on this. Hi Chris, the custom background only displays (and is only needed) during the online (down-level) phase of the upgrade. After the first restart, windows setup enters WinPE where the user experience is streamlined with upgrade methods. The custom background only masks the desktop which is still running, so you can still do ctrl-alt-del for example to bring up task manager and start a process, or Alt-Tab to switch applications. Right, I understand that, but our task sequence has custom reboots both before and after the upgrade. First we run the readiness and assessment, then update the BIOS and reboot, then OS upgrade happens. After the upgrade there is some hardware changes that might cause a reboot and then there a few steps that happen after that, and an install updates step. So after you do a managed reboot, do users log back in, or do they just let the TS run? Yes, we would like them to not log back in. Just let the TS run. That would be difficult to achieve unless you reboot into WinPE and do your extra activities there, or configure an auto logon then display the custom background again. But even then the ConfigMgr client takes an minute or two before it’s ready and the TS continues. There’s not a lot you can do at the Windows ctrl-alt-delete / lock screen to my knowledge. Thanks for this! I am having an issue though where if I run the pre-cache task sequence, I can see the files in the cache. Once i run the actual upgrade I can see it still downloading file to the working directory, so I have 2 copies of the content on the machine. Any ideas? Ah, that will do it. Unfortunately I was trying to avoid that because we want to have a single task sequence for multiple models…and we download drivers specific to each model…I’ll keep looking, thanks! I have integrated this and when a win10 upgrade fails during the “upgrade the Operating System” step the custom background never goes away, so the user is unable to see the error message unless you right click the custom background. That should not be the case if you set the Upgrade Operating System to continue on error as per the example task sequence. The system should reboot and then the task sequence will handle the error with the custom steps. The upgrade OS step failed before a reboot was initiated (0x80004005), so the reboot never occurred and the custom background window stayed in the foreground. The TS Notification was hidden and the error message was shown, but only after I right clicked the purple screen could a user see the error message. Sounds like your TS is not configured as per the example? 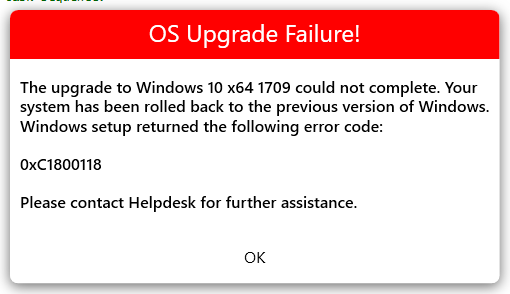 Question is: if the Upgrade OS step is set to continue on error, why did it not continue? Only if it continues can we handle the error with a custom notification. 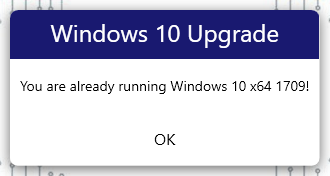 Thanks, I double checked your example and see I missed a restart computer step after the upgrade and before the OS Upgrade Failed step. Added that back and will see how it goes! Great stuff Trevor! Is there a way to email me when the TS initiated and failed with the subject contains computer name and model ? Certainly that’s possible, you can simply add a PS script that uses Send-MailMessage or the .Net mail classes. But when sending email from a client you need to check whether your smtp server permits a relay and whether authentication is required and which address you can send from. If you have Orchestrator you can also use that to send email, which is something I do for our OSD task sequences. AddTypeCommand	RunPowerShellScript	12/20/2017 4:11:42 PM	2980 (0x0BA4)"
For Windows 7 you will probably need .Net 4.5 and WMF 4.0 or 5.0 as a minimum for the scripts to work. Great Job ! Would love to see helper post on how to implement in MDT or any suggestion on How to would be greatly appreciated! I’d like to add, I want to keep the ability to “Upgrade” on the OS version level. Imagine a scenario where say, an app was stripped out that the customer actually needed. Or maybe someone upgraded on their own by manually scanning for updates on a network that was not preventing them from doing so. 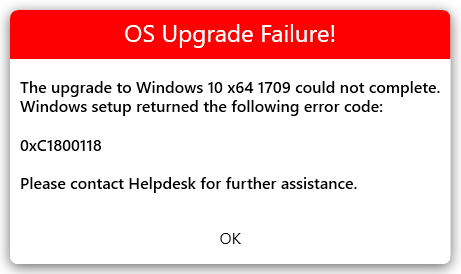 Running a 1709 to 1709 upgrade is a great way to save all the user data and get the user back to a standard build. Aside from this little note, I’d like to thank you for posting. I saw some much less eloquent ways of doing this on other posts, but plan to incorporate this. Nice one! I was thinking about the rollback phase in task sequence and the user notification. If setup kicks a rollback during “winPE” phase then the user cannot see this message because TS ends to logon screen. Admittedly I haven’t tested that scenario, but the rollback TS step should engage if a rollback is performed, that ought to run in the online OS. If the task sequence detects that the version being upgraded is already installed, what’s the best way to kill the “upgrading” wallpaper and prevent the TS from continuing? I noticed in your example task sequence that if this situation happens it does not fail or complete the task sequence, just continues on, and it also doesn’t kill the custom background. That should not be the case if the task sequence is configured correctly. 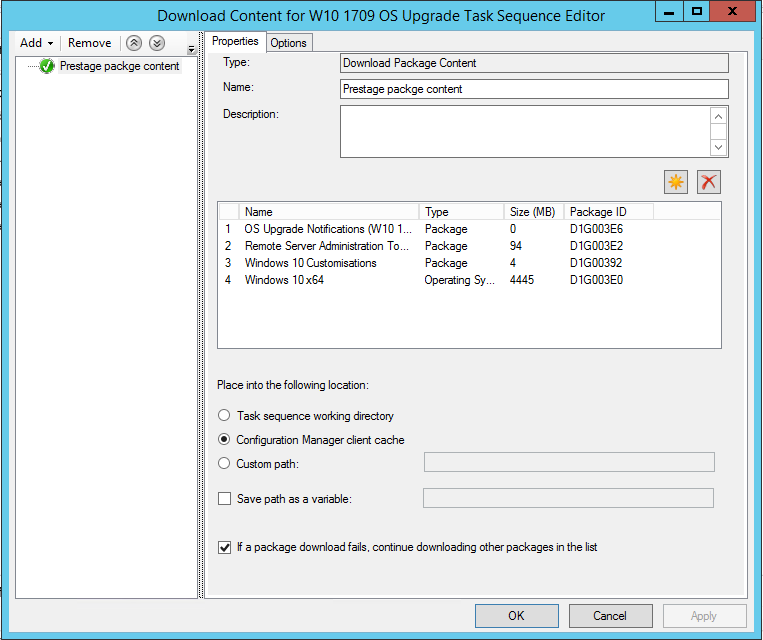 In the example, the first step that runs sets that “WindowsVersion” task sequence variable, and the rest of the step groups will only run if the current version does not match the version number you set in the step conditions. Ok, I didn’t see those conditions before on each group, that would explain it then. Trevor – what Chris said basically. In the Section ‘Windows Version Check’, if its already at 1709 it will set that TS variable and all subsequent steps in that section will run with that variable set. However, there is not step to fail it out. We had to add a fail step, basically copying other ‘Fail TS with OS Upgrade return code’ steps. Its fine now, just wanted to let you know your TS.xml is missing a fail step in the initial windows os check. Other than that, we find this solution very valuable and are going to be using it for our enterprise! Are there any prerequisites that apply? To test the window pop functionality, I have used your TS with your scripts in a package. Changed the condition on all steps for version 1703 as that is our current version. I was testing only the window pop if Windows version is same. It appears to run as I see a brief powershell window and then no message window pop. I tested the logic using psexec64.exe -s calling powershell and all the required switches. It too failed. I haven’t tested on PS versions older than 5 and .Net framework 4.5 is probably needed. Thank you for all your work on this Trevor. It’s been very helpful. I’ve been testing this on some HyperV VM’s running 1511 and 1607, using it (modified) to upgrade to 1703 (that’s the most recent version allowed in our org). I’m having mixed results however. It’s worked on a couple VM’s without issue (so I’m pretty sure I didn’t break anything with my modifications) however on most of my tests, the upgrade fails right after the first reboot, and the system boots back to it’s original OS with the error code “the upgrade to Windows 10 x64 1703 could not complete. Windows setup returned the following code. 0xd1900107. Googling this error hasn’t given me any good clues to go off of. 2 of these machines are absolutely clean installed version of 1511, and the others are our base company image of 1607 with Feb 2018 updates installed. Does this error mean anything to you? Running setup.exe manually is also useful as the GUI often gives more info about any issues. You ever see the OS upgrade throw a exit code of 3247440400 instead of 0? That happened to multiple systems today. 3247440400 is supposed to be the code from the upgrade assessment. It also rolled back the OS too, so not sure why the failure group ran that was only supposed to run if SMSTSSetupRollback did not equal true. Nevermind, I figured out my issue. I’ve noticed that when we try this on 1709 devices it prompts that they are already on 1709 like it should… and then it closes the Software Center but maybe 30 minutes or so later it ended up giving a countdown to a reboot and ended up rebooting the device and running the upgrade to 1709 on the device again. Is there something that I’m missing? Hey Trevor, this is awesome stuff but I’ve run into an interesting issue. Nervermind, I found the solution. Didn’t add the required assemblies. I am trying to create a pause before continuing and not have any success. The idea is that I will have a section run to see if there is USB devices connected and if so prompt to remove them. That code looks like the following. The problem is that the prompt does come up but it still continues onto the next section without a button being clicked. Is this the best way to go about this? Yeah the way the code is called into the user context does not wait for any response. So to achieve that you would need to identify the PowerShell process that was created and wait for it to exit. There is a WaitForExit() function on a process object in .Net. Run that either in the script that invokes the user-context script, or in the TS step immediately after. Also you can’t load or set TS variables in the user context, it only works in system context. Great stuff, thank you for making this available! I’ve got a great looking F12 OSD TS but until I came across this, my upgrade TS wasn’t really making me happy, I love the validation check and custom background. I do have an issue with the background though, it doesn’t display in 50% of cases, it is invoked, I see the tslog shows it was launched and returned a “0” exit code but I see nothing, I have seen it work as expected on some upgrades, so it seems some local condition exists that prevents it from instantiating? Any ideas on what to look for to trap? These are all fresh W10 1709 machines being tested for the 1803 upgrade, nothing else, so I know the pre-reqs must be correct. Seems like a sporadic problem that’s more prevalent on slower VM’s, I haven’t yet seen a physical machine fail but 80% of my testing has been in the VM lab. Will the graphic still display if no user is logged on when it’s invoked, but rather say 5 or 10 minutes later, is a logged on user required for the script to display a BG? Thanks Trevor for a great description. However, I still have a problem in the section: “Check Readiness for Upgrade”. 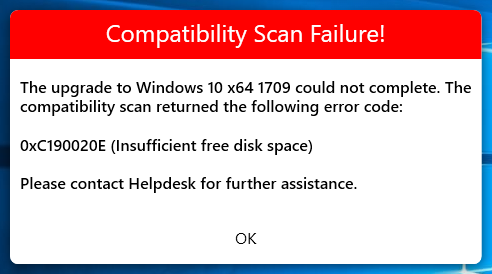 You wrote in the description ” Where the compatibility scan or OS upgrade fails, the step is set to continue on error so that we can handle the error ourselves”, so for „Check Readiness for Upgrade” I marked „Continue on error” because it wasn’t marked. After this procedure no message was displayed and the OS upgrade process is continuing, but it shuldn’t (no required amount of disk space). Could you advise what is the reason messages do not appear? 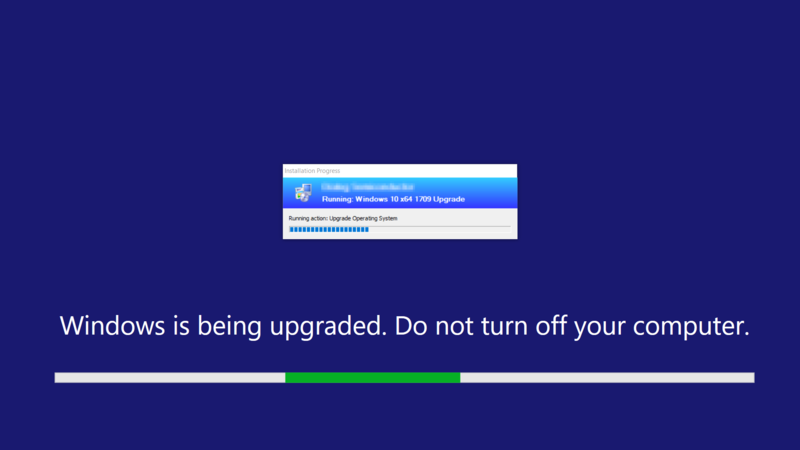 I seem to be missing something with using the existing process, but modifying it to upgrade to 1803. The 1709 upgrade works great as you described, but when I make the change to the TS to instead, use build 1803, the target machines say that they are already running 1803, when in fact they are running 1709. Anything I should look for? Hi Trevor, is it possible to show message over all opened windows? Thanks. 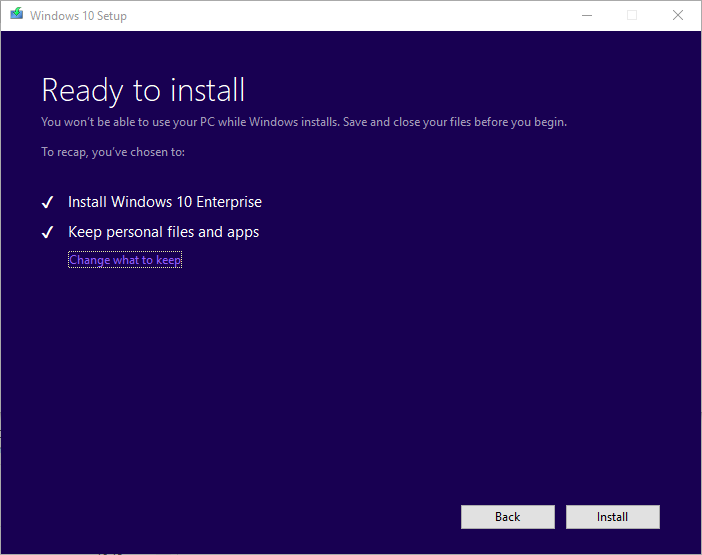 Trevor one more question, at the moment message appears, install continue without interruption, my aim prevent unexpected reboot while in-place upgrade…. do you have any ideas? Hi, you would have to set the ‘topmost’ property on the windows to $true. Yes you can do that way if you prefer. But if you have links in the message box, these will try to open in SYSTEM context, which is quite a bad user experience! Great stuff. Most part seems to be working fine but I running into one specific issue. Upon successful upgrade from Win 7 to Win 10 1803, after few minutes of logon, the upgrade TS kicks in again and starts the deployment again. Also the status icon of TS remains as new. Although it doesn’t do anything, but in software center, under OS , is keeps spinning with status Installing. Any clue why it would do so ? I know removing it from the collection will do the trick but that would not always be case. 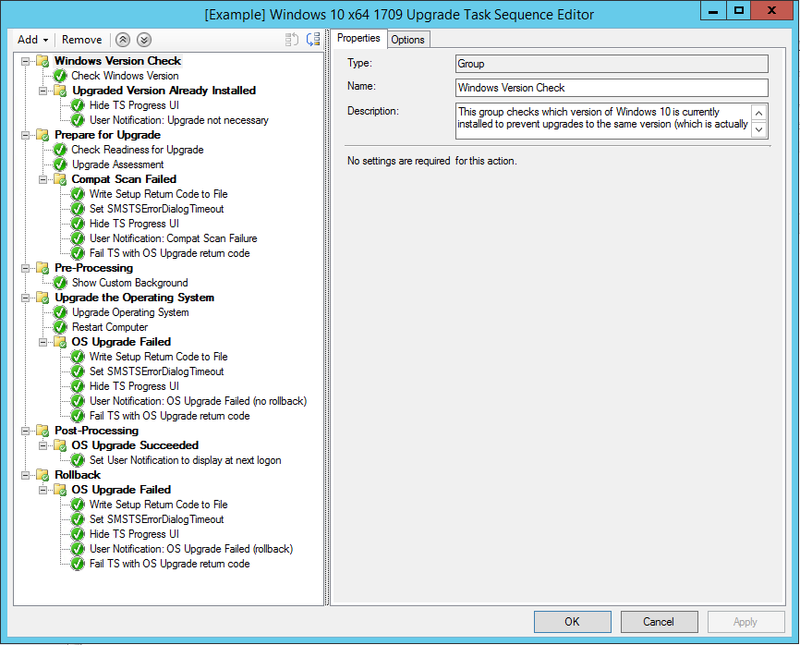 Are you running some post-upgrade steps in the task sequence? Trevor, do you think those notification windows would work in WinPE with the PowerShell add-on? Can you give me a few pointers on how to make this work with 1803 onwards please. Download do not work on TechNet, is it only me or are the file missing? This is so great – I’ve implemented it in our task sequence and I love the notifications and the look and feel. Kudos. Do you know if there is a way to make these popups happen even if the computer is locked? Right off the bat, we restart the computer as part of the task sequence, so if the user doesn’t log in right away they miss the prompt. Logging in after the task for showing the upgrade in progress message causes the user to get no notification. Not for this solution, you’d need to run the splash screen as a service. You could check out the solution from OneVinn which does something similar and does run as a service.